What you do in your kitchen and the way you cook and serve food is uniquely yours, and your kitchen island should attest to that. Take an inventory of what current gripes you have about your kitchen. Do you often complain you don’t have enough counter space? Do you wish you could face the conversation while cooking or doing dishes instead of looking at the wall? Then design your kitchen island to fulfill these wishes. From gathering around the kitchen island with family to prepping Thanksgiving dinner and beyond, your kitchen island is probably one of the most used locations in your home. As such, you need to make sure that it has a solid, durable surface that will stand up to the test of time. 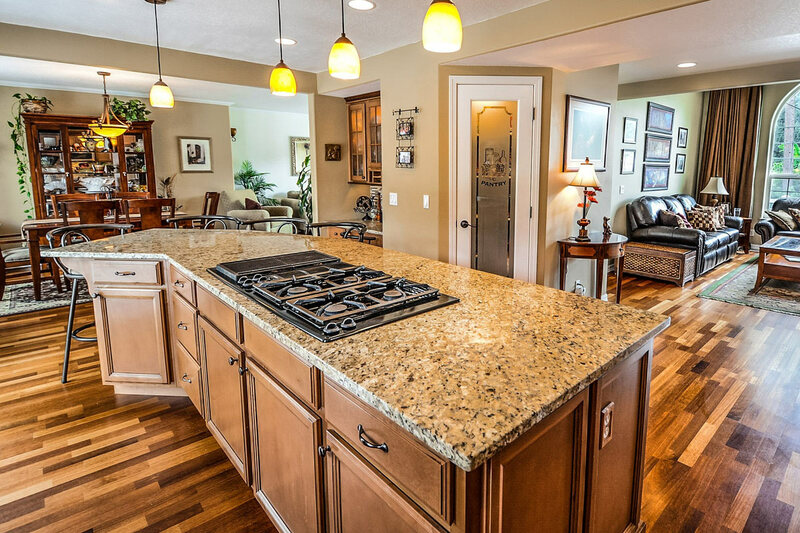 Granite countertops are a popular choice because they can withstand everything you throw their way, including hot pans and spaghetti sauce. Some other heavy-duty options include concrete, quartz, or butcher block. Yes, the top of the kitchen island is certainly of the utmost important, but when you are designing your perfect kitchen island, you want to make sure you don’t forget about the vast amount of space underneath it. Look at your current kitchen and make note of what items you wish you could store out of sight. Then, customize the storage options under the island to fit these items. Whether that means a large open cupboard for your stand mixer or pull-out drawers for all the random items that seem to collect over time, now is your chance to get everything organized. As excited as you are to design the perfect kitchen island, one component you don’t want to overlook is the lighting above your island. You need to be able to aptly see all of the food you will be dicing and slicing. Pendant lighting is a popular selection for kitchen islands because it provides excellent task lighting while making a design statement. Another option is recessed lighting if you prefer the openness above the island. And since it’s your kitchen, you can always do both if you so desire. What makes the perfect kitchen island? The answer is different for everyone. As long as you take the time to design an island that meets all of your needs while being functional and beautiful, you will enjoy many amazing moments gathered around it.